Cane toads and their advancement towards the Kimberley have been of concern to SEEKS for several years. SEEKS members have been instrumental in raising community awareness about cane toads and their impact on biodiversity through displays, public talks and newspaper articles. Frogging nights with Frogwatch NT have been conducted to increase appreciation and awareness of our native frogs. With the assistance of an NHT Envirofund grant, cane toad messages which include the call of the cane toad, are being broadcast on the local Warringarri radio station. Through these activities, SEEKS hopes that many members of the community will recognise cane toads both by their call and appearance, so assisting early detection of invading cane toads. It is also important that native frogs such as the Giant Burrowing Frog are not mistaken for cane toads and inadvertently destroyed. In association with Frogwatch NT , SEEKS is also promoting trapping in the Northern Territory , as a means of slowing the invasion of this threat to Kimberley wildlife. Based in Kununurra, SEEKS is an incorporated group promoting community involvement in the conservation of native plants and animals in the East Kimberley . Projects such as surveys and research on native wildlife and environmental weed control are undertaken. 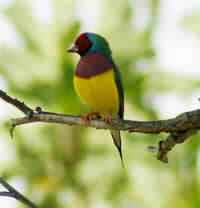 The group formed in 1999 to promote awareness of the plight of the Gouldian finch, as part of the recovery project for that species. In previous years SEEKS members have been involved with Mirima National Park flora and fauna surveys, the Birds Australia Atlas Survey and have assisted PhD students with research on water monitors and estuarine crocodiles. SEEKS members meet monthly to co-ordinate project activities, share information about native plants and animals and discuss local conservation issues. Guest speakers are invited to share their knowledge and expertise. Topics have been wide ranging such as fire, weeds, ecotourism, mistletoes, bats and crocodiles. Meetings are held on the third Wednesday of the month at 7.00pm at the Kununurra Historical Society building on Coolibah Drive Kununurra. Minutes of the meetings with details of current projects and coming events are distributed monthly to members by mail or email. Anyone is welcome to attend meetings and excursions and help out with projects.